Owning a waterfront home is a privilege not many people enjoy. Wake up to the sight of calm waters. Spend your days sailing, fishing, wakeboarding, and more. Watch the setting sun turn blue waters golden. A waterfront home is more than just a house – it’s a lifestyle. 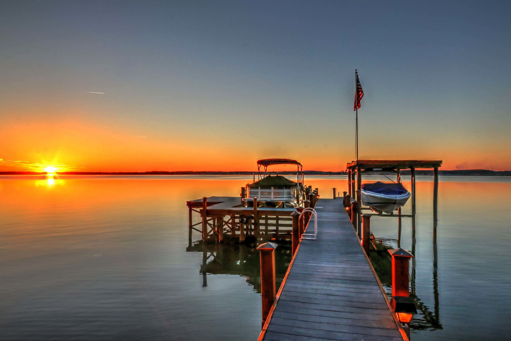 Experience the best of waterfront living in North Carolina. Here in the Tar Heel State, you’ll find an array of luxurious homes nestled along the shores of Lake Norman – which, at 34 miles long and with a 520-mile shoreline, is the largest manmade lake in the state. With such a large collection of waterfront homes, choosing the right one is the difficult part. You will find waterfront Lake Norman properties in a variety of communities, from the booming towns of Cornelius, Davidson, and Mooresville to smaller ones like Sherrills Ford and Terrell. NC waterfront homes in the Lake Norman area often come with two to five bedrooms, along with spacious yards and patios to help you make the most of the unique lakeside setting. Vaulted ceilings, hardwood floors, granite countertops, and stainless steel appliances are common features. The largest of these homes can have as many as six bedrooms, including plush master suites with walk-in closets and his-and-hers vanities. Homes in the higher end of the market also often come with outdoor pools, observation decks, and views of the water from every room. Want to build your very own dream waterfront home from the ground up? Vacant lots measuring half an acre or more are also available. Get in touch with David Dunn at704.999.3591 or send an email to David.Dunn@SothebysRealty.com to get started on your search for the right Lake Norman waterfront home. The main advantage of living in a waterfront home is the lifestyle. With direct access to the water, you can go boating, water-skiing, swimming, and fishing in your own time. Living right on the water also brings you the kind of peace and seclusion that you would be hard-pressed to find anywhere else. A waterfront home commands spectacular views of the water – not your neighbor’s front lawn. Then there’s the fact that waterfront homes are in limited supply, and are therefore almost always both in high demand and highly valued. This is particularly true in the Lake Norman area. Lakefront homes here continue to increase in value and are always sought after. With proper maintenance and care, your waterfront home will have tremendous resale value. You can also rent it out if you don’t intend to use it as a primary residence. Lake Norman offers limitless boating and fishing opportunities aplenty. Striped bass, white perch, and catfish swim in its waters, making it a popular destination on fishing tournament trails. There are also numerous marinas that offer boat slips, boat rentals, and maintenance and repair services. Along its shores you’ll find yacht clubs, country clubs, golf courses, and parks. These include the Peninsula Yacht Club, Lake Norman Yacht Club, Mallard Head Country Club, Peninsula Club, Cowan’s Ford Golf Club, and more. Need more information? Call 704.999.3591 or email David.Dunn@SothebysRealty.com today.